The organ that stands before you is the result of several years of study and planning. We are grateful for the members of this congregation for the commission of this grand instrument. 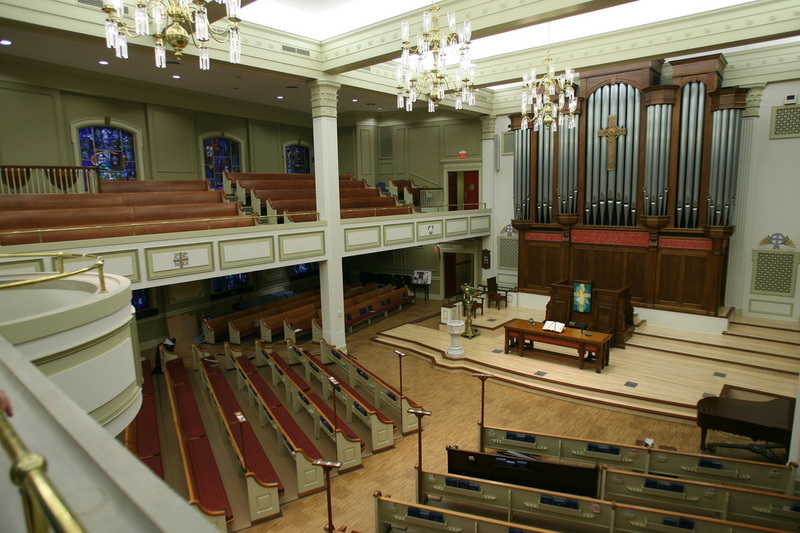 It was built by the A. E. Schlueter Pipe Organ Company of Lithonia, Georgia under the direction of Arthur Schlueter, Jr. and Arthur Schlueter III. Together they provide direction to over 30 artisans in the building and rebuilding of pipe organs. The organ chassis, inclusive of the organ case, console, windchests, and winding system were built entirely by the Schlueter craftsman. In a desire to be mindful of the reason for the instruments we build, the seal of the company, “Soli Deo Gloria,” (God alone the glory), is included on the console maker’s plate. Quality organ building is never the result of one individual but is the result of the synergy of a team. In this respect, our firm was ably assisted by the clergy, music staff, church staff, organ committee chairman and the members of the organ committee. 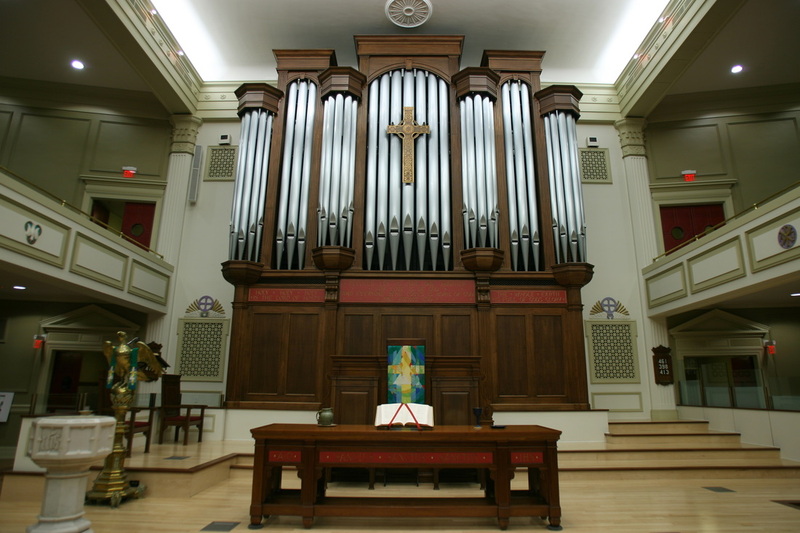 These individuals readily gave of their time and talents and provided invaluable assistance from the inception of the organ project to its installation and tonal finishing. Their efforts, coupled with the craftsmen of our firm, have resulted in the creation of this unique instrument. In designing the new organ case we wanted to include elements from the previous chancel. It was important to us in our design to balance the visual beauty of the organ case with the Cross, making it the central visual element in the room. The organ case is built of Lyptus with the exposed façade pipework made of brushed zinc. This proved to be a beautiful visual paring but we were also guided by making an environmentally responsible choice. Lyptus wood is a sustainable, plantation grown lumber that has a growth rate of 1” per year to allow harvesting in 14-16 years as opposed to the 40-100 years for other similar quality forest species such as walnut. It is being planted in areas alongside and with the reintroduction of native plant species that were previously agricultural and grazing lands. This wood provides a very beautiful grained wood that finishes well and complements the older walnut that is in the pulpit. The organ is built on two levels and has a steel and wood structure that is encased by the organ façade and case. The lower portion of the organ contains the swell and choir divisions of the organ that feature wooden louvers on two sides to allow the volume of the enclosed division to be regulated by opening and closing of the louvers. On the top of the organ behind the façade pipes are the pedal and great divisions of the organ. The organ was designed to focus a certain amount of its energy into the church balcony. This was assured by stop placement and a special set of shades for the enclosed divisions that direct some of the swell and choir division into the gallery. With the removal of the soft pew pads this area is used to coalesce the organ sound and to make the organ in the room seem to have a longer reverberation time than it actually has. 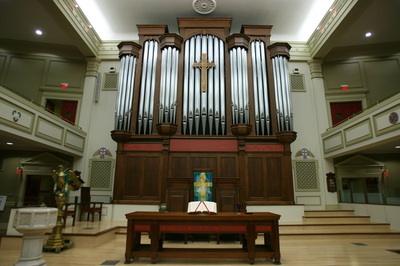 The new pipe organ for New York Avenue Presbyterian Church is a custom-built instrument in every manner and is comprised of 62 ranks or sets of pipes. These sets total 3,543 pipes installed within the organ case. The building of an instrument of this scale is a monumental task requiring thousands of hours that are visible and seen, and many thousand more that are unseen. The organ also has thousands of board feet of lumber, miles of wiring, and thousands of parts. The specification was developed to be able to play a wide body of repertoire and provide complete support for choral and congregational accompaniment. I personally want to thank the church for the degree of trust placed in my hands in development and refinement of the specification as I worked with the final design and organ scaling. 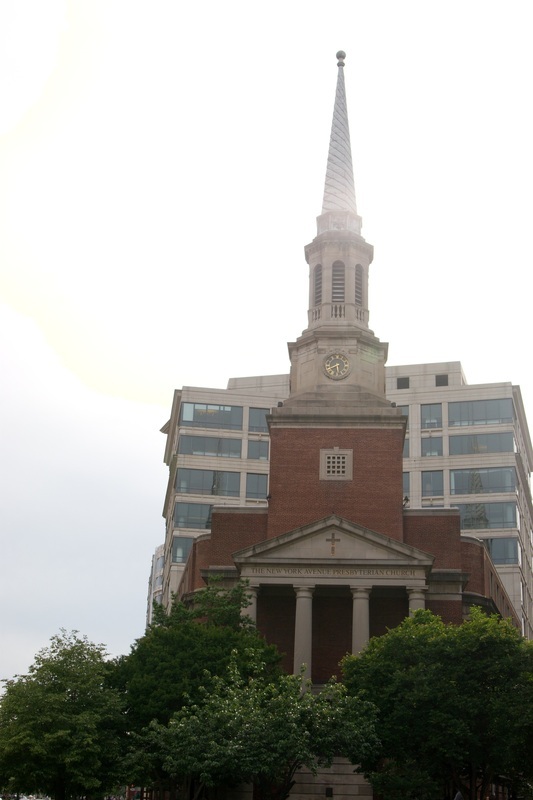 This truly lets art flourish, which I hope is apparent to the current and future congregants of this church. To aurally place the organ in the room we have been completing the process of tonal finishing. In this process, every pipe is individually adjusted from proper speech and color. This is an exacting process that requires a great deal of time, patience and skill. As is the practice of our firm, the tonal finishing of the organ has occurred with several repeat trips to work with the pipes and evaluate the results. The past number of months we have been working on the organ and custom voicing the organ for the room acoustic. We find that this method of tonal finishing results in a finer degree of voicing than is possible from one concentrated trip. This work has been accomplished by Daniel Angerstein, Peter Duys, Lee Hendricks, Gerald Schultz and Bud Taylor. It is expected that over the course of the year we will continue to make small changes and refinements as the organ settles into its new home.